In this Siteturner round-up, we examine some of the best WordPress themes for writers currently available in 2019. Aspiring writers of fiction and non-fiction, bloggers, journalists and other literary professionals who are looking to build their first WordPress site, or simply give their existing site a professional looking makeover, can do so inexpensively with the help of one of these premium themes. We selected the themes on this list by hand, and based our choices largely on the quality of their design. The best themes for writers are always those that draw focus to the content itself, and you’ll note that many of our selections lean toward an elegant, minimalistic aesthetic. Bold, tasteful typography and white space win out over visual noise and extraneous, distracting gimmicks. Because WordPress is first and foremost a publishing platform, the must-have functionality for writers, bloggers and publishers is native. Beyond those basic features, you should also take user experience, speed optimization and SEO optimization into account. You want your readers to find you, and you want to provide a pleasant enough experience that they return. Sluggish, difficult to navigate WordPress themes that confuse search engines are best avoided. The themes on this list are all expertly coded, search engine optimized and user-friendly. Oh – and responsive. It’s not 2005 anymore, so make sure people can read your site on a tablet, even if you personally hate tablets because reading on a tablet is blasphemy or whatever. Finally, if you don’t find what you’re looking here, you might want to check out our related article 22+ Best WordPress Personal Blogging Themes for more options. You may also want to take a look at Best WordPress Themes For Resume Writers. If you aren’t sure you want to use WordPress, you may want to consider using a cloud based website creator. Check out our comparison of WordPress, Wix, Weebly, and Duda. If you’ve got any suggestions, or think we missed a particularly strong theme, let us know in the comments below. I know, I know. You’re thinking, shut up and get on with it already. 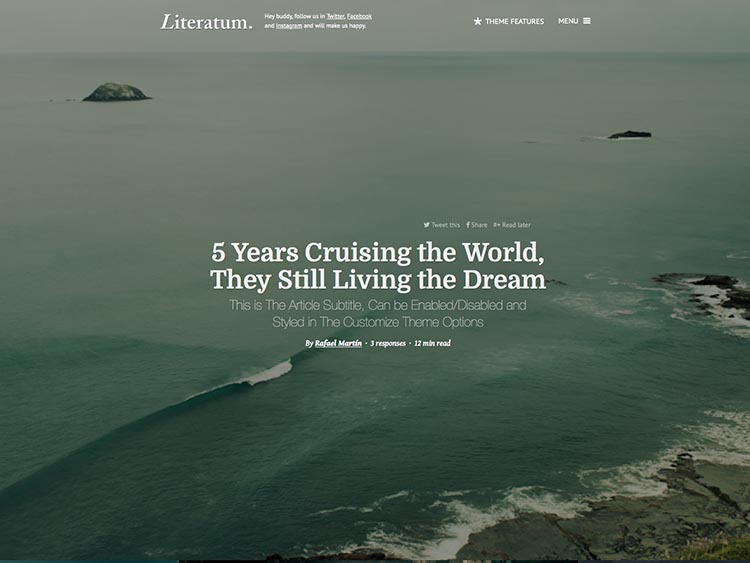 Easily our favorite on the list, Literatum embraces a contemporary, cutting-edge design that brings to mind editorial, journalistic and confessional media sites like Thought Catalog. It’s perfect for focusing your readers attention on the content itself, and expertly makes use of striking, fullscreen photography and large, bold typography. Some of the noteworthy features of Literatum are its user-friendly, AJAX-based navigation, its custom author avatars, and its large, featured images for every created category. The theme is updated regularly, and the latest incarnation even supports video covers for posts. 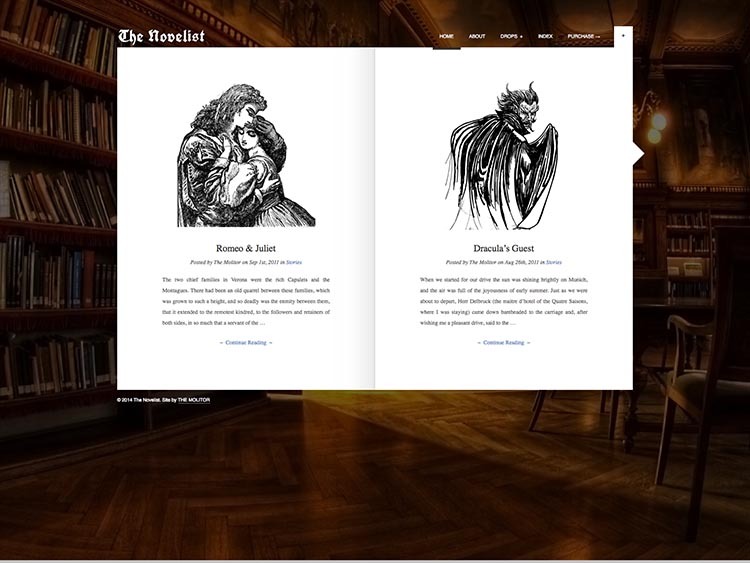 The theme is compatible with the Aesop Story Engine, too, which allows you to convert regular articles into interactive stories. Literatum supports two third-party comment systems out of the box, Disqus (our favorite!) and Facebook comments. There’s even specially support for interviews. This one’s highly recommended, folks. Elegant by Themify is a stand-out example of minimalistic web design, designed by professionals at the top of their game. Elegant completely does away with all unnecessary animations and effects in order to focus attention entirely on your content. This is a design philosophy we fully get behind at Siteturner. Remember flashing text and annoying Flash intro pages? We do, and we hated them. Gimmicks that aim to impress usually wear thin quickly and annoy site visitors. There’s a lot to be said for just cutting to the chase. 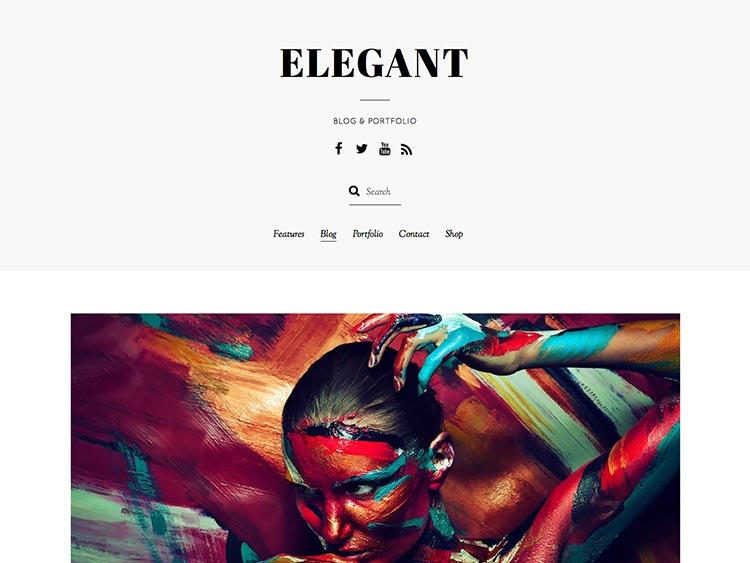 Elegant includes the fantastic Themify drag & drop page builder, which gives you a lot of control over how your site will be laid out and look to your visitors. Six pre-made skins are available out-of-box, but the customization panel will allow you to change the color of virtually every element. Additional features like a Team post type/page and a portfolio also make this more than just a WordPress theme for writers and bloggers. An especially good choice if you want some room to grow. 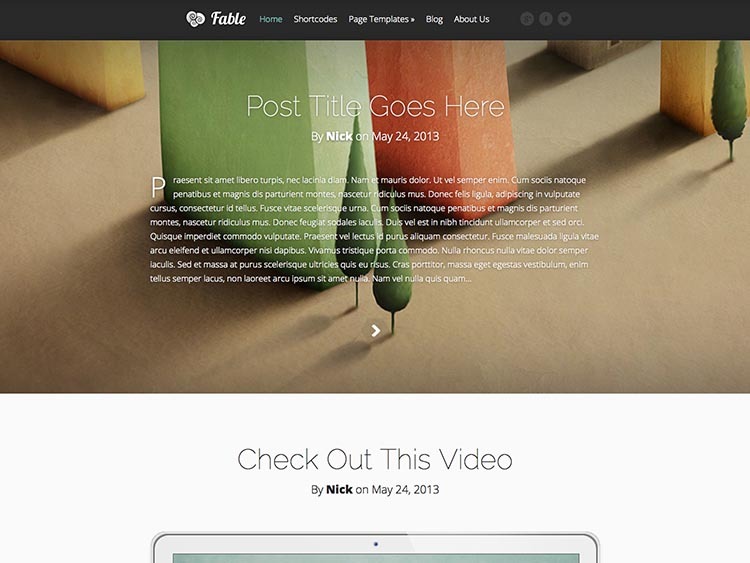 Fable, by ElegantThemes, was built for storytellers. The fantastic use of color, constrast and space ensures high-readability. If you’re looking for eye-popping graphics and a bit more bang-for-your-buck visually, Fable is an excellent alternative to some the minimalisitc designs we’ve included on this list. The theme is responsive, and easy to customize. The ElegantThemes ePanel gives you control over a variety of elements and features. Turn things on and off, manipulate the layout, manage advertising, control colors – even take advantage of the built-in SEO management. Lots of cool shortcodes are bundled in that extend functionality. In the interest of full disclosure, we should note that we are affiliates for ElegantThemes. This means that if you choose to purchase Fable through our link, we’ll receive a commission. This did not influence our decision to include it, however. If we didn’t think it belonged, it wouldn’t be here. 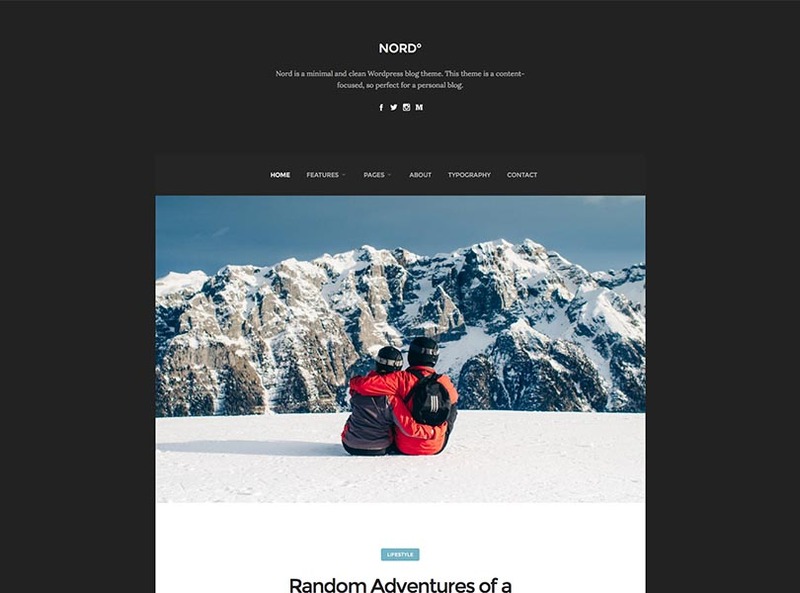 This stripped-down, classic-style blogging theme is a perfect example of content-focused design, and its simplicity and usability makes it a great fit for writers and authors of all sorts – whether writing about travel, food, design, politics, or whatever, dude. Flat, modern web design trends are put to good use, and the clean typography and liberal use of white space ensures high readability. There’s just enough options and settings in the admin (via the Live Customizer) to allow webmasters to apply their own personal touch and brand. Custom backgrounds, logos, and unlimited color options are all supported. The necessities! The code is clear and light-weight, and Nord is SEO-friendly, responsive for mobile devices, and even retina-ready for crisp viewing on high-resolution smartphones, tablets, and monitors. Well-documented and a cinch to install and setup. 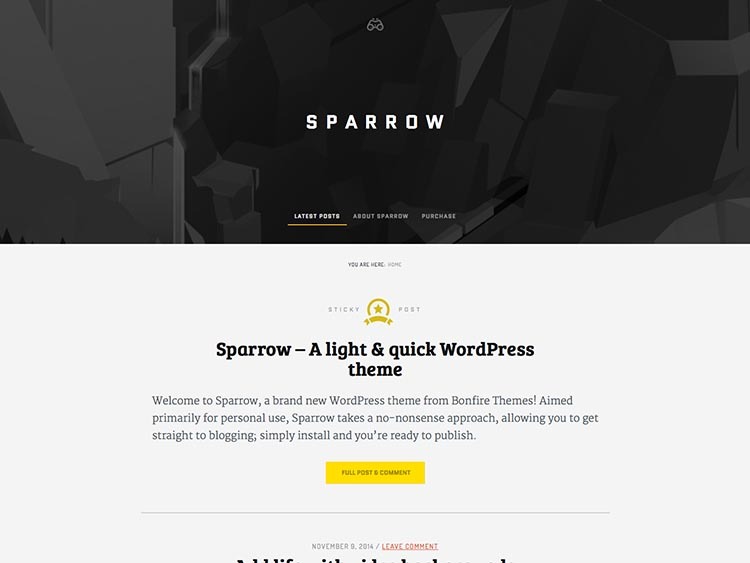 The beautifully designed Sparrow theme cuts to the chase and eliminates the bloat you find with many premium WordPress themes for writers. Just install it and you’re ready to go. Subtle flourishes like CSS animations and elegant, retina icons add just the right amount of sophistication. There are a few settings on the backend, if you want to dig into those – users can easily upload their own logo, randomize header backgrounds, and a bit more. This is a lovely, no-nonsense package, and earns another strong recommendation from us. 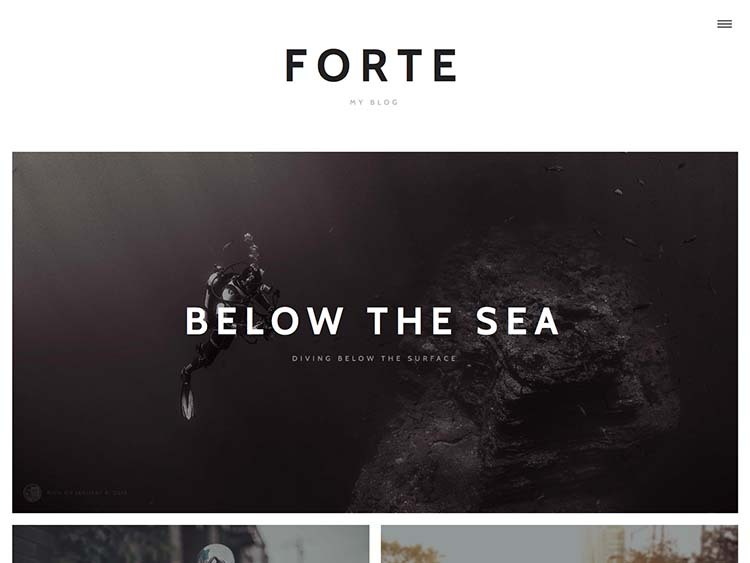 The full-screen Forte theme relies heavily on striking photography to draw visitors into you content. Retina-ready design ensures a crisp, gorgeous display on the lastest high-resolution devices, and 100% responsiveness translates to above-average performance and usability across the spectrum of smartphones and tablets. SEO optimization works to build your presence in the SERPs, and the theme is easily customized and branded using the options provided in WordPress’s native Live Customizer. A light-weight code base ensures snappy performance, and XML demo data is provided for fast a setup. Fully translatable and well documented. 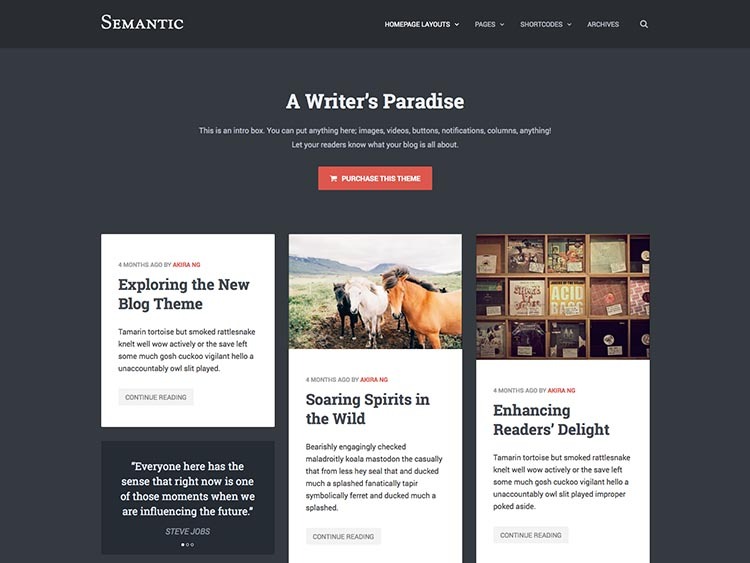 Semantic comes on strong with a trendy, flat design and masonry based layout. This responsive theme was designed with writers, bloggers, publishers and other internet content creators in mind and built using the popular Bootstrap 3 framework from Twitter. Three homepage layouts provide flexibility and choice, and excellent support and styling for the various WordPress post formats allow visitors to discern the different types of content at a glance. The theme is bundled with a selection of useful shortcodes, and an intuitive, easy to use options panel gives you even more control on the backend. The theme is well documentation, translation ready and comes with demo content to help you get up and running quickly. 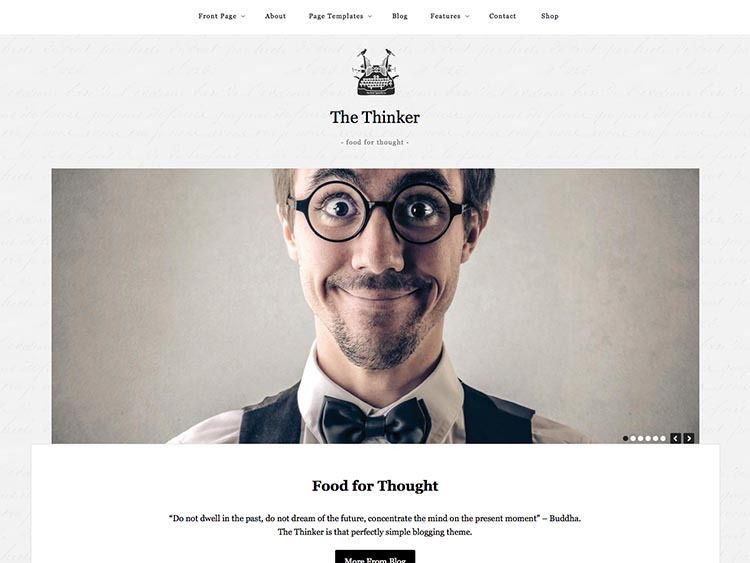 If you can look past the rather obnoxious stock photo on The Thinker’s demo, you’ll find an extremely capable blogging theme that’s a great fit for aspiring writers and blogging professionals alike. The design is minimal and content-focused, and the clean, understated layout ensures high readability. This one also includes a few extras some of the others don’t. Most notably, the popular Soliloquy slider is bundled for free, giving you the chance to create eye-catching homepage slideshows and make a lasting impression on your visitors. The theme also supports WooCommerce: have some merchandise or writing you want to sell? It won’t be a problem. Options-a-plenty can be found on the backend. Adjust colors and fonts to your hearts content and preview those changes in real-time thanks to WordPress’s built in customizer. The Thinker is translation ready and easy to install and use. Grateful opts for a slightly different approach than the other WordPress themes for writers we’ve looked at so far. The fixed-position left sidebar makes navigation and branding available at all times, and users can scroll through content on the right. We expect at least a few of our readers will prefer this user-friendly layout. Grateful is simple in implementation, but does come with a useful theme options panel for customizing colors, typography and uploading your own background images. XML demo data is provided, and the the theme is translation ready. 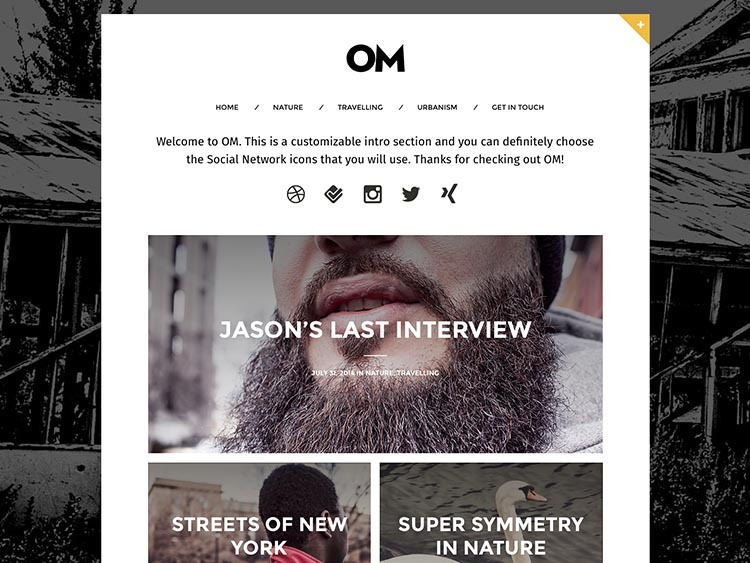 OM is the name of this WordPress writer’s theme, and while we have no idea what it means, we do kind of like it. It’s another minimalistic theme, and OM relies heavily on large, evocative photos, high-contrast and bold, crisp typography to make it’s mark. Three layouts are available for your homepage, blog, and archive pages, and users can choose to use an option sidebar on their posts and pages. As you’d expect, there’s not much bloat on the backend of this one, but it provides several useful options regardless. (All changes can be previewed in real-time thanks to integration with WordPress’s own Theme Customizer). OM is optimized for HiDPI and mobile devices, and includes plenty of documentation. Its fully translatable and child theme ready. Hands down, The Novelist is the most unqiue literary theme on our list, and while we expect it won’t quite work for some of our readers, other readers will fall in love with it at first sight. I mean, it looks like a book, and we do love books. The designer notes that it was created for “serious writers looking to showcase their talents”. That sounds about right. The theme is responsive, and arrow key, AJAX enabled navigation from page to page is supported. In the backend options, users can upload their own fullscreen backgrounds, change link colors, customize the logo and more. Support for the Google Fonts library is built-in, in case you want to change the typography. This theme has a 4.5 star rating on ThemeForest and almost 1000 sales, which means two things: it’s both easy to use and the support is fantastic. Check out the demo if you’ve got a moment to spare. Why is it that virtually all the themes I’ve seen for writers on this and other sites are covered with images instead of words? There’s a real disconnect here. Supper awesome collection thank you for sharing. Thanks for your post. What I want to point out is that while searching for a good on-line electronics store, look for a site with entire information on critical indicators such as the security statement, safety measures details, payment options, along with terms along with policies. Often take time to see the help in addition to FAQ sections to get a superior idea of the way the shop is effective, what they are able to do for you, and just how you can make the most of the features.